Ian ...you rock, after all that you have been through and obviously with no fault from you, at all.... you really went out of your way for me ,came and meet me, face to face and made me a very happy chappy, this phone is better than in every way the Best phone I've ever tried your a straight up front dude alright big respect thank you. If another company misleads you about being #1, can you trust their warranty and quality claims? We take honesty in business really seriously and so should you - it is your money after all. So when we saw a competitor making advertising claims like this: "No.1 for Rugged Phones in NZ", we thought you should know the real story. 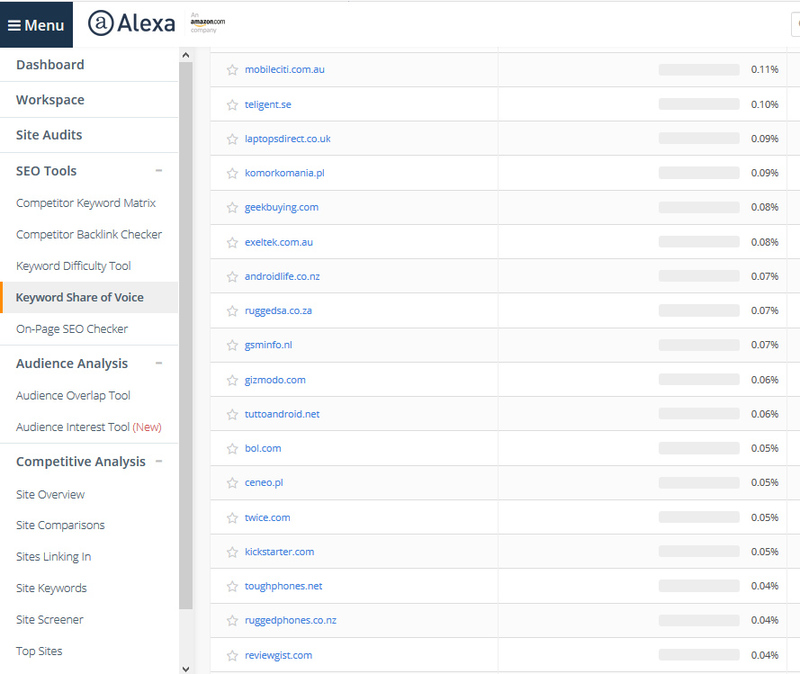 Alexa is a global web analytics company owned by Amazon. For the search term 'rugged phone' it ranks the Outdoor Phone Store* as the #10 website globally, and #3 globally for actual phone stores (behind #1 Amazon and #2 Verizon Wireless USA). The closest NZ phone retailer behind the Outdoor Phone Store is Parallel Imported at #14 globally, while our misleading "No. 1" competitor is actually ranked #72 on the list. According to official Alexa data, the Outdoor Phone Store has 49 times more searches for "rugged phone" than our competitor. Expressed another way, for every five of those searchers who land on the misleading competitor's site, 245 people have visited the Outdoor Phone Store. The moral of this story? If another rugged phone store has to mislead you about how popular they are, what does that say about their business and about the other assurances they try to give you? The deceptive behavior of a rugged phones competitor just keeps getting more entertaining. Knowing our site is only registered on Alexa under its original URL for InvestigateMagazine, the competitor has plucked a non-registered URL of ours to compare itself against. That duck won't fly. We are branded globally under many names. The one you hear on NZ radio is www.outdoorphonestore.com, which points to theoutdoorphonestore.com via investigatemagazine.co.nz. But we have around a hundred domain names internationally. Want to see them? Click here. One final thing that proves how deceptive they are: The Alexa images above show world rankings for web traffic on the search phrase "rugged phone". No matter which way you slice and dice it, this site is receiving more traffic on this topic than any other phone retailers in NZ, Australia or the UK. Only Amazon and Verizon Wireless get more searches for "rugged phone". Like we said above, our competitor is down at rank #72. Would you trust buying a phone from a company that finds basic marketing honesty so very, very hard? Welcome to The Outdoor Phone Store, NZ's biggest importer of rugged phone technology. Cheapest is not necessarily best for your needs, neither is the most expensive. We sell a couple of really cheap models because customers asked for those options. The cheapest phones run on older software and have only 2GB of RAM (think 900cc car engine). If you are genuinely only using your device to make phone calls and send txts, and that's all, these may be a good choice. You are not buying a cheap phone to get great photos or fast software. The minimum amount of RAM for Android 7 is generally 3GB (think 2 litre car engine), and if you want to use your phone for browsing the web, sending emails and using Facebook, you are better off with 3GB or more. 3GB/32GB is what the Galaxy S6 ran. Our 3GB AGM M004 is running exactly the same processor as the 2016 Samsung Galaxy A5. The current standard for Android 7 is 4GB RAM and 64GB storage (think 3 litre V6). This is what the latest Samsung Galaxy has, and our mid range outdoor phone has this configuration. RAM is not the only performance guide. Processor speed, expressed in GHz, will determine how fast your phone is as well. The cheapest phones are running as low as 1GHz, while the Galaxy S8 is at 2.5GHz. Right at the top is the AGM X2, the most advanced outdoor phone in the world. If you want a phone that floats if dropped overboard, this is it. If you are wondering about the technology behind our phones, you will notice most of them are powered by either the MediaTek Helio series chipsets or Qualcomm Snapdragon chips. MediaTek ships nearly a billion chips a year, most of those in smartphones like the Sony Xperia, some Samsung Galaxy models, Alcatel models and the phones we supply here. The Helio series provides incredible power balanced by super-efficient processing, giving your smartphone plenty of punch when needed but longer battery life. It is an all-round performer. The Helio is designed to support high-end cameras of up to 24 megapixels, which is why you'll often find Samsung, Sony and even Leica cameras in our phone range. There are only four main chipsets for Android: the MediaTek range, the Qualcomm Snapdragon range, Huawei's Kirin and Samsung's Exynos chips. The fact that Samsung designs phones to use MediaTek Helio and Qualcomm Snapdragon instead of Samsung's own chips is an indicator of reliability and quality. All smartphones, including Samsungs and iPhones, are now made in Asia. Smartphone development has gone down two paths. One is slim, sleek and wall to wall glass (which looks great but is fragile), and the other is durable and robust. The sleek and fragile phones cost the most (because they are marketed as fashionable objets de desir), and because Apple and Samsung put their most expensive chipsets into them to help justify the price. But fragile phones are not built to take life's knocks, and that's part of how the big players make money. A $1500 phone replaced on insurance is just another sale in a competitive market. The alternative is here. Half the price, but similar performance and more durability. There are other rugged smartphones on the market, but they are not as good as the ones we have selected for the Outdoor Phone Store. For example, you can pay NZ$800 for a Sonim XP7, and you will get a rugged phone with only 1GB RAM and 16GB storage, running on the old Android 5 Lollipop. You can pay more than $1000 and get a Cat S41 or S60 (from bulldozer company Caterpillar) running only 3GB RAM and 32GB storage - around the same performance as our AGM which costs half the price. The new Galaxy S8 Active will retail at more than $1500 in NZ, with only 4GB RAM/64GB storage. So that gives you some idea of the international recommended retail prices for this technology. There are different frequency bands for different areas of the world. A Sonim bought from its NZ importer here will work on NZ networks, but a customer of ours made the mistake of privately buying a Sonim from overseas himself, only to find it doesn't work on any NZ mobile provider. Don't make the same mistake. Our prices include not just the import GST and Customs duties payable and a full kiwi warranty, but also our expertise in sourcing only the specific phones compatible with NZ mobile networks, which means we can guarantee your phone will work. Yes, it is the same photo of the same phone used in the manufacturer's marketing, but not all model variants work properly here. We've done the hard work so you don't have the hassle. All you have to do is browse our store, choose your phone, and relax knowing it will be with you in most cases in between 2 and 7 days (not weeks via 'free shipping'), it will work, and if anything goes wrong we can take care of it locally and quickly. WHY DO OUR PRICES FLUCTUATE? We buy stock in USD so the first impact is exchange rate fluctuations every single day. The second big factor in price movements is the wholesale rates from our supplier, which can vary between $30 and $100 on any given phone on any given day. When they put a model on special we can drop its price here - and when models come off special their prices rise. When stocks get low in the supply warehouse they raise prices to manage demand. All of these factors mean that our maximum RRP for any given phone will be set at the top of the range of expected price fluctuations, and we manage the on-sale 'special' rates on a daily or semi-daily basis depending on exchange rates and price movements as explained. More RAM (6GB) than a Galaxy S8. Lightning fast octa-core 2.4GHz Helio processor. 64GB internal storage. External storage capacity up to 256GB micro SD. 16MP Samsung camera rear/8MP Samsung camera front. Full HD 5" screen. Waterproof. Dustproof. Massively shock resistant. Fingerprint security. Google Play. Long life battery. 12 mth NZ warranty. Tax and GST deductible for business use. Don't pay $1,500 for 4GB/64GB Galaxy S8 Active, or $1,000 for a 3GB/32GB Cat S60. BLACKVIEW 6GB/64GB ONLY $699 today! Teenager-proof: "It didn't smash when my friend threw it on the concrete!" Came off charge at 7am. By 10pm, 61% still left on battery. WHY BUY FROM US? These are not cheap parallel-imports or copies from fly-by-night online stores in Asia with no real warranty and which could be hit with extra Customs duties and import GST as they cross the NZ border. These are genuine factory-supplied units backed up by NZ warranty and service from The Outdoor Phone Store. Why is that important? Try sending back overseas a wrongly-supplied item with lithium batteries these days by air and see how much it costs you! Our prices include NZ GST and are fully tax deductible for business use. We make sure the particular model variants we sell are the ones tuned to NZ mobile frequencies. And we make sure that if you order today, you'll have your phone in two-days to a week in 96% of cases, not four weeks by slow surface 'free' shipping. In short, buying from us is risk-free. We guarantee you won't get hit with extra Customs fees. We guarantee you will get your phone, fast, and we guarantee it will work. On every NZ network. Photos taken with Blackview's Samsung camera by users.